Thailand, a unique melting pot of modern & ancient cultures, proffers an interesting array of travel options to tourists. Here’s a lowdown on some places to see in Thailand. A wonderful blend of the traditional and contemporary, the Kingdom of Thailand entices more tourists from far and near than any other country located in south-east Asia. The region is so well endowed that it proffers something for everyone. From incredible natural beauty and majestic temples to unique ancient kingdoms and stupa-encrusted mountains – you will find them all here! Hit any good local restaurants while gallivanting during Thailand travel. Khao Pad, Pad Thai, Tom yam, Gai Pad Khing - relish any of these or other popular mouthwatering dishes here. Thai food is famous for its zealous use of fresh herbs and spices as well as fish sauce. By all means, this experience is sure to liven up your spirit while vacationing in Thailand. Thailand offers a mind-boggling number of travel options to travelers. However, here’s info about those which are hot-favorite with the tourists. The large bustling city of Bangkok, Thailand’s capital occupies the top slot in the travel itinerary of maximum tourists. Those who have been here swear it’s a perfect embodiment of the ancient and the modern. It’s the administrative point as well as the heart of the entire country. It’s a place where you will see ambitious skyscrapers flirting with the blue skies. Surprisingly, you will also find Bangkok steeped in its age-old culture and tradition. Ritual and religious ceremonies are executed on an everyday basis in Bangkok. The Bangkok city is such that you will seem to be in the 21st century one moment, whereas traversing through antiquity the very next. The city has a wide range of world-class accommodation ranging from elite hotels to fairly priced guesthouses for those on a shoestring budget. Bars, cinemas, concerts, etc. Bangkok’s nightlife too is truly riveting. Situated about 700 kms from Bangkok, the Chiang Mai that also known by the name ‘Rose of the North’, is the most tourist-visited province in Thailand. Chiang Mai was originally the capital of the Lanna Thai Kingdom created by King Mengrai in 1296. Chiang Mai is situated on the Mae Ping River some 310 metres above sea-level and is an abode of natural beauty. Tourists love to explore the lush mountainous terrains here. Swirls of mist and fog during winters create a dreamy romantic atmosphere, which is a unique experience in a tropical country! Umpteen wild flowers growing profusely in the region and national parks teeming with wildlife make Chiang Mai a nature lover’s paradise. Tourists can visit little villages neatly tucked away in the undulating terrain of Wat Phra That Doi Suthep and Doi Intanon – Thailand’s biggest mountain. Koh Chang is not only the biggest of the 52 islands located in the Koh Chang Marine Park and also the largest in the whole of Thailand. A major part of the Koh Chang island is rainforest and comprises a series of hills. This makes up a very mesmerizing landscape, which acts as a unique background for some fabulous bays and beaches in this region like Ao Klong, Hat Sai Khao and Ao Khlong Prao. Koh Chang teems with an amazing range of wildlife, including exotic birds, snakes, deer and elephants. The island and its neighborhood area provide best opportunity for snorkeling and diving. You will find a good number of diving centres proffering crash courses and guides for various adventure sports here. Kayaking and sail boarding are also available on this island. This 247-square-kilometre island is Surat Thani's most significant tourist attraction. The most excellent beaches of Samui silhouette the northern and eastern coasts. The most popular ones among these are Hat Chaweng and Hat Lamai, which also good accommodation facility to tourists. On the southern end of the Lamai bay are the famous phallic rock structures ‘Hin Ta Hin Yai’. The three waterfalls - Namtok Hin Lat, Namtok Lat Wanon and Namtok Na Muang - are linked from west to south with a single path. At Na Muang, a lot of tourists opt to go elephant riding. One can also explore some old Buddhist monuments located in these parts of Thailand. For instance, Phra Yai is a huge seated Buddha image at Fan isle, whereas Phrathat Hin Ngu is a stupa containing the Buddha’s relics. This one’s an island province, infact Thailand’s largest approximately the size of Singapore. Phuket is located some 862 kms away from the country capital, Bangkok in the Andamans and is a very popular tourist destination. Phuket has a fine history in tin mining and rubber production, profiting massively from falling enroute the famous Silk Route between India and China. The beaches and bays here are chief enticements for locals and tourist alike and offer good food and accommodation facilities of all kinds. One definitely should not miss out on tasting the delicious sea food when traveling in Phuket. At the same time, the island provides excellent opportunity for various fun activities like treks, walks, snorkeling, diving, etc. Do also pay a visit to the Karon, Kamala and Kalim beaches here. Accommodation / Where to Stay in Thailand? Tourists will find varied options available to them as far as the accommodation aspect is concerned in Thailand. From posh costly hotels to fairly medium and cheap food and lodging facility – you will find them all in Thailand. This makes traveling anywhere in Thailand a comfortable and relaxing affair. The good thing is that Thailand hotels not only offer entertainment centre also alongside food and lodging facilities like casinos, swimming pools, sports bars, pubs, libraries, shopping malls and so on. You can also consult a travel agent to help you choose a good accommodation as per your means and preferences. 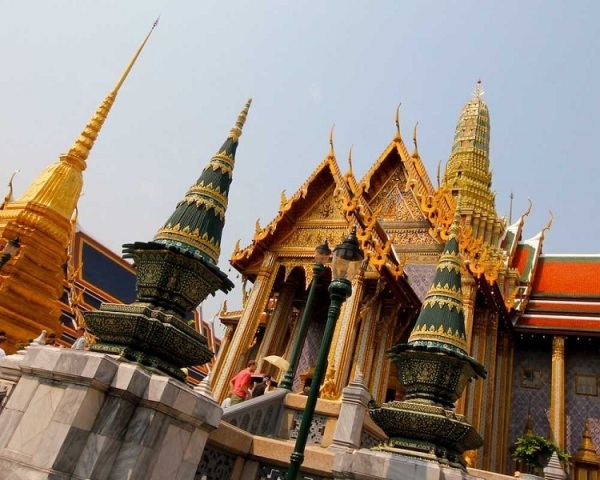 The Bangkok city is Thailand's main entry point for inbound and outbound tourists. You arrive through Bangkok's Don Muang International Airport, which is linked by daily flights other major airports across the globe. Constant rail services connect Singapore and Bangkok with intermediary halts at places like Kuala Lumpur, Butterworth and major southern Thai towns. Entrance to Thailand via roads is limited to three road crossings - Songkhla, Yala and Narathiwat - the three Thai-Malaysian borders. There are no customary steamship links with Thailand. Cargo ships arriving at Bangkok's Klong Toey port at times have passenger cabin facilities too. Apart from these, cruise ships like Cunard's Queen Elizabeth 11, Royal Viking or Pearl of Scandinavia sporadically visit Pattaya.